That’s okay, if your only exposure to preppers is through Doomsday Preppers or other media sources, it wouldn’t be hard to get the impression that we’re all a bit crazy. So what if you don’t believe that the world will experience a polar shift or supervolcano eruption or mass nuclear war (as in Alas, Babylon) in your lifetime? What if all that just seems a bit wacky to you? Well, let me assure you, you’re not alone. However, it’s not a reason to throw the idea of prepping out the window. There are other reasons to be prepared. Reasons that are a little more mainstream, reasons that might make sense to you, the average Joe or Jane. Here, I’ve compiled 10 not-so-crazy reasons to have an emergency kit and stock a little extra food, fuel, and medical supplies. In short, these are everyday reasons to be a prepper. 1. Job loss or underemployment. Especially in this economy, there are many people out of work. If you were to lose your job tomorrow or get your pay or hours cut, having a little extra food and cash on hand could help keep your family fed and a few bills paid while you’re looking for work. 2. House fire. According to ready.gov, “each year more than 2,500 people die and 12,600 are injured in home fires in the United States.” Having a plan, and knowing your evacuation routes, and practicing fire safety and evacuation drills can help your family not be a statistic. 3. Cuts and scrapes. Hey, I said these were everyday reasons. How many times have you been away from home and needed a band-aid for yourself or one of your kids? Wouldn’t it be nice to have an emergency kit with medical supplies in your car? 4. And speaking of the car kit–how about those emergency snacks or diaper changes? Yep, it can all be there in your emergency kit in the trunk. 5. Not to dwell on vehicles, but mechanical problems are not unheard of. Do you have a way to contact help and a way to keep your family warm or hydrated while you wait for help to arrive? Or a flashlight and the know how to change your own tire? Lots more likely than an EMP. 6. Natural disasters. Choose your own adventure here. The natural disaster you are most likely to encounter will vary depending on your location, but something like the tornadoes that occurred this past week can bring about the end of YOUR world as you know it even if it’s not “the end of the world”. A bit of preparedness can go a long ways toward keeping your family safe and/or being able to administer medical attention in the event of a natural disaster. 7. Evacuation. We had an area evacuated recently due to a wildfire. What will you take and will you be able to get out in time if your home is threatened with destruction? Where are your birth certificates, vehicle titles, stock/bond certificates, and other important documents that could cause problems if they are destroyed? It would sure be helpful if they were all in one place that was easy to find. Even if you just need to produce a birth certificate to enroll your child in school or a social security card to get a job, it’s nice to know exactly where those important documents are. If you have an evacuation plan, a list of things to grab, and even better, a kit to grab and go with essentials in it for yourself and your family for a few days, you’ll be one of the first on the road instead of stuck in evacuation traffic. Sweet. Especially if you’ve kept your gas tank above half full so you can get all the way out of town without having to stop with everyone else and fill up your tank. 8. Family unexpectedly comes to town. Do you have extra bedding for them? What about enough food to offer to feed them while they’re in town? 9. Last minute food. Maybe you found out someone was sick and needed dinner brought to them, or your kid is supposed to bring something to the potluck after play practice today, or you are asked to bring something to a bake sale, or there’s a field trip that you forgot about and someone needs a sack lunch, or any other food emergency. It’s sure nice to have some meals and snacks you can throw together without a trip to the store. 10. Power outage. What will you need to stay warm, fed, and alive with no power? If you have some extra food on hand and a way to keep your house warm (or cool for those of you in the south), you’ll get through the experience with a lot less stress. There’s a start. What everyday reasons can you think of to have some extra preparations on hand? Excellent, down to earth, list of reasons for everyone to exhibit common sense behavior! What has happened with programming like Doomsday Prepper, is the degradation of anyone who does anything (no matter how small) to be responsible for themselves in the case of unusual circumstances. Just like the pejorative ‘survivalist’ in the late ’80s, early ’90s, the mainstream media demonizes any preparedness behavior, they paint a picture of near lunacy then mix in normal folks who are doing what they have done for generations to cause the masses to consider ANY common sense behavior to be abhorrent. The same thing happened in 1999 with Y2K preparations, show the extremes, mix in the farmer, make everybody who gardens and cans look like an extremist. The Modus Operandi is always the same, the goal is to keep people from being personally responsible. The picture you chose for your blog is obviously everyday products in a quantity that would fit in most kitchen cupboards. Far to many people worry about long term food storage before they think about the short term. Suppose you fall into one of the ‘hard times’ scenarios listed here and need to eat from the pantry for merely a month, you start opening cans that have been packed to last 25 years and are now obligated to finish them within a year. Your long term or serious situation plan has been compromised! I applaud you for encouraging people to be rational. About 35 years ago, a friend and I went out of town, shopping. The stores in the tiny town we lived in closed at 5 pm. We both had husbands and children. She was distraught that she did not have anything for dinner because the stores closed before we got home. I told her to just eat whatever was in her cabinets. She said she had no cans of anything and no meat. I was flabbergasted. I actually had to give her three cans of food and a package of chicken from my own meager stores. At that time, I had another week of food most of the time. It might not be fresh vegetables, but there were cans and meat for a couple of meals. I was not preparing for anything, just had food. We discussed it. She saw no reason to have more food in the house than she needed for the coming week. She shopped and bought exactly was she needed for the next week and not one can more. Many people live that way still. 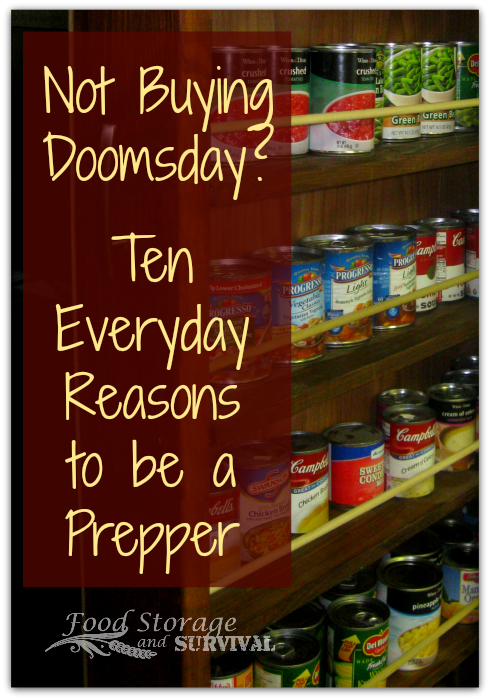 Very good reasons to start putting back food storage. I’m trying but have little space. I don’t have a basement or an upstairs and I can a lot of my foods and have them stacked in the bedroom. Water is my main concern. I’m going to have a hand pump put in so I will have fresh water and won’t have to rely on the city. Troubles with Iran and the possibility of nuclear war scares me. I wish I could afford an underground shelter of some type. I watched the Doomsday Preppers and the ones that I wanted to see again have been taken off. They have good ideas. We’re in the same boat on space issues. We have food stacked behind the couch, under the beds, etc. Food storage takes up a good amount of room, but with a little creativity you can get quite a bit even in a small house. There are tutorials on how to hollow out the bottom of your couch and make it like a storage ottoman. This is something I personally plan to do soon. Also to do the same for your beds, use bookcases on their sides for the outer edges and have the middle hollow, put your mattress on a flat board that is hinged so you can lift it and access your storage. If you own your home consider the hollow wall space between studs, can you put shelves in or a secret cabinet instead? Normal everyday furniture can be turned into easy storage if you are willing to put the work into it. When I showed hubby the couch idea he instantly loved it because he wanted a better way to his his guns and he can put a lock on it if he wants. If you can fit a double bed in a couch frame think how much storage space that is! And guests won’t know unless you tell them. We’re limited too on space, nut keep at least enough canned and packaged goods to hold us over for about 3 months (so far. I make sure that canned goods that we purchase have an expiration date at least a year or more in the future. Even if you’re limited on space, by making sure you have water and dehydrated bags of food is definatly smart. Living in Va sometimes we get random hurricanes that shut us down. My family and I live in a small apartment, but we always have water on hand. 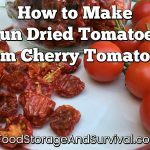 When the hurrican hit last year, we had stored some dry soup and with a simple camping stove that runs on batteries we still ate well enough despite no power or water for a week. All in all I totally agree with prepping for lifes common events. If the world ends I’ll be one of the “screw this” people. The geological signs indicate the movement in the Earth’s crust is on the increase and more so as we approach 12/21/12. Thanks for sharing a sane perspective on “prepping” I dont really like the term as it implies some “major event”. Really its just common sense to be able to handle an unexpected situation like heavy rains/snow making a trip to the store difficult and dangerous or getting sick, or car breaks down. I have always been amazed at how poorly people are prepared, while the rationality of extreme long term prepping is debatable, FEMA only recommends minimum of 3 days, I think 2 weeks should be the minimum and 8 weeks recommended. I live in hurricane country, and when one threatens plywood flies out of Home Depot, water disappears off shelves etc. I of course already have the supplies on hand. But what really amazes me is that after the storm threat passes with no impact, and then when a new storm threatens weeks later the same thing happens. What happened to the supplies they already bought? In 2005 I lost power for 6 days and wasnt severly impacted, I had stores of food and water and fuel and a generator. Another reason to store weeks of food is it allows you to buy quantities when they are on sale. This can really save a lot of money. Other than fresh produce, when I shop I look for 2for1 sales and rarely do I ever buy at full retail. I use my foodsaver and freezer as well as canned goods for my every day needs its naturally rotated since Im constantly using it and I figure I have at least 2 months of food in my regular rotation. I do also have some longer term stores of dehydrated goods, beans, rice, protein powder etc but nothing too extensive. I am really enjoying the information here. I hope that at some point things will turn around and prepping will be a normal part of our society. I was really impressed with the Japanese people in dealing with their disasters last year. I read that the calmness came from the preparedness that had been taught. I fully agree about preparing for the smaller bumps in the road that occur more often. We buy insurance for everything and no one thinks a thing about it. That’s really a form of prepping for a disaster. I think prepping is something past generations worked on regularly because they depended on it. We’ve become naive that thing could quickly change. I still have a long way to go on stocking up, but I hope to learn some new skills as I do. This summer I’m going to learn canning. I also think I’m going to try to build a portable rocket stove and learn to cook on it. Having a home that is all electric scares me if we lose it for days. Loved the series. When can we expect session#2.Weather it be doomsday or just goods common sence. away and i rode with him. We stayed 3 days before coming home. of clothes or tow would been nice to have. The simple act of canning foods or buying canned food, to keep on hand, a Non-cook could fix quickly just in case the main cook (mom or dad) gets the flu or God forbid, something major. Any canned veggie, meat, or fruit could be warmed up to keep all the tummies full, take a little of the stress off and make the going a little easier. Even after the sick person gets back on their feet prepping could make things a lot easier when they need it also. Being prepared is NOT a dirty word. I live in the South where a winter storm warning can empty a grocery store in hours. Most people don’t realize that in a wide-spread disaster, shelves CAN’T get restocked quickly. Our system of just-in-time inventory management will create huge back-orders not to mention the impossibility of getting transportation coordinated. So, if your health depends on something, make sure you have a 3 month supply. It could take a month for peanut butter to reappear on a shelf (if someone doesn’t beat you to it). Prepping makes sense! As you can see I stockpile, mainly because it is the cheaper way to buy groceries because I buy when the prices are low and buy enough to last our family until they go on sale again. BUT having a stockpile gives me peace of mind if there were an emergency (we live in Wyoming where winters are harsh and tornados hit in the summer) and in case of job loss. In fact 6 years ago my husband was injured at work when his hands got crushed in machinery and it was my couponing and stockpile that kept us from not having food to eat. It is just smart to have extras on hand because like it is true…life IS like a box of chocolates, you never know what your’e going to get. i have been into food storage for 23 years now. have tought it in my ward (foodstorage spe) and stake. i have tryed to relate that food stroage is importion and a must ( realy for now days the way this goverment is takening us over a clift) and that each family is responsibility for its self. i have been threatened by members who say ” we will take some elders and come over and take what we want. i have been called doomer ( kind of proud of that name) and have been treated badly. yes there are those who support the idea of foodstorage in my ward but we are far and few. some say they will reliy on manna form god but i tell them if the lord has instructed them to store for the 7 years of good time against the 7 years of bad time they still insist on wateing for the manna and will not hear what the church has to say about it. This is an excellent post! But I would like to add that families and people with pets need to prepare for them as well. I keep an ER bag packed aside from BOB bags. It has snacks, entertainment for me & the kids, a couple rolls of quarters and a bunch of ones, a small first aid kit with gauze in it, a vomit bag, med masks, a change of clothes for me and a list of places that deliver food to the hospitals we usually go to. My kids have asthma and are accident prone as is my hubby. ER trips are frequent in my family so I have a bag to grab anytime we need to go so we can go quickly and if someone gets admitted and I need to stay I have what I need to get me through a day or two or until someone can bring me more stuff. In the past I’ve taken in a child and expected to be treated and sent home an ended up being there for a week, I’ve also gotten calls from hubs work and had to haul all the kids with me to meet him there and it took hours for him to be seen and in the mean time I had to feed my kids dinner and keep them from running wild in a non child friendly Hospital. We dot have pets now but when I did I always had extras for it and kept a spare leash and collar in the car along with a collapsible water dish and a small bag of food and some treats. If you loose your job and your are struggling to feed your kids how are you going to afford your pet? For pets there is no reason not to prep for them, too. Other than really small dogs, most can manage a saddle bag designed for dogs, and those bags can hold enough food for several days, as well as extra water, medicines, etc… Practice with them now on your regular walks, so they are used to it. You can also buy temporary emergency litterbox kits at the grocery store; they’re plastic trays with cat litter included, so all you have to do is tear off the cardboard lid. We’ve got 3 of these in our Go Box, for our cats. Most people lose storage during housefires. I’ve been writing a novel about life in an Apocalypse and Mountain House is one of the things my main group have stocked up on. I did some looking around on youtube on how to cook and the tastes of…. and appears to be easy to make AND tastes good too. #1 saved our bacon when my husband came home from Iraq and had his rehire rights denied him. Prepare, people!! I live just north of L.A. I can not believe the amount of people I know that do not even have water in their cars! What part of earthquake country do they not understand! I have two 72 hour kits, first aid, water , and formula and bottles and diapers, and I don’t have children…but it’s for the dummies that won’t have it and I can then help! I like this article. I am a prepper myself. I am 17 years old, and i’ve been prepping since i was 13 years old. It all started in 2008 when the market crashed. I lost my house at that time. Me and my family was homeless for 3 weeks. We had little food and water, and we had little bit of money. The most biggest problem was that my dad had open back surgery at that time. It was hard living at that time. Our grandma let us stay at her house for 6 months. But she kicked us out over an argument. And so we were homeless again but for 3 days only. Thank god that someone from a church had a house in her backyard that she let us stay till we got back up. It took about 2 years for us to get a home. Now back at that time, i wasn’t a prepper. This is my first event that i have ever witnessed that was horrible. I began prepping when i was 13. I did more research on why did we lose our house in 2008. The first thing that popped up was The Market Crash. I did more research on that. And i didn’t realize that this was the reason why i lose my home. Reading this didn’t scare me, but it made me realize that this can happen again. I am also prepparing for Anarchy and the collapse of the Government. The reason why is because first, our economy is so messed up. over 19 trillion dollars in dept? That’s a really big sign to prep. Second is Anarchy. I remember watching the news in the past where i’ve seen total riots. I would not want that to happen in my neighborhood. But let’s say that will happen in my neighborhood and city, I will defend my self, my home, and more importantly, my family. I have a few friends who are in this with me. So even through my darkest days of prepping, they will support me in any way they can. And i will support them to.